Eligibility: For the spring 2019 application period, all undergraduate students enrolled at any institution of higher learning in the State of Delaware may apply, except for those graduating at the end of the spring 2019 semester. All students must have the active support of a faculty or scientist advisor and a minimum GPA of 3.0. The DWRC will provide a $3,000 fellowship per undergraduate intern, paid as hours worked at $10 per hour, up to a maximum of 300 hours. Internship projects may start in September 2019 and can be funded through the end of the Spring 2020 semester with a final report and poster submitted in May 2020. Interns are also required to participate in a poster session at an undergraduate research conference in the spring. Contact faculty, reach an agreement to work together, and identify your topic to investigate. Faculty may not advise more than two interns concurrently and must provide matching funds consistent with DWRC guidelines, usually by committing a percentage of their time to the intern’s project. The following application must be accompanied by (1) a copy of student’s unofficial transcript, (2) resume mentioning any special skills or experiences such as prior internships, (3) a brief statement about your area of expertise or interest that relates to water resource management, and (4) a brief description (1 page) of the research or education project proposed for this internship. Interns will be selected by the DWRC Advisory Panel in May 2019. Requirements: Applicants must email the application and attachments listed below as a single PDF file with your name by Friday April 19, 2019 at 5:00 pm to Martha Narvaez, Policy Scientist, mcorrozi@udel.edu or 302-831-4931. Your resume with special skills or experiences such as prior internships, research projects or lab assistance experience. A brief statement about your area of expertise or interest that relates to water resource management. A one-page research plan including the topic of your research in consultation with your advisor. UD Water Resources Agency – Internships are supported which focus on water resource policy and management. UD College of Agriculture and Natural Resources: Projects are supported to work with faculty in the departments of Animal and Food Sciences, Entomology and Applied Ecology, Applied Economics and Statistics, or Plant and Soil Sciences. For example, an internship in the Department of Plant and Soil Sciences could relate soils, plants, and land management to water use and quality. UD College of Arts and Sciences: Students can conduct internship projects in Biological Sciences, Chemistry, Political Science, Public Policy, or other subjects closely related to water resources. UD College of Earth, Ocean, and Environment: Internships are supported in the areas of Geography, Geology, Marine Biology and Biochemistry, Marine Policy, Oceanography, or Physical Ocean Science and Engineering. UD College of Engineering: Projects can be developed in areas such as Chemical Engineering, Civil and Environmental Engineering, or Mechanical Engineering. Delaware Geological Survey: Researchers offer internships focusing on hydrogeology, ground water supply, and water quality. Delaware State University: Faculty support internships in the areas of agriculture, natural resources, aquaculture, and aquatic ecology. DNREC (Delaware Department of Natural Resources and Environmental Control): Staff in DNREC offices related to water resources occasionally offer internships on topics such as soil and water conservation, water quality, and climate change. 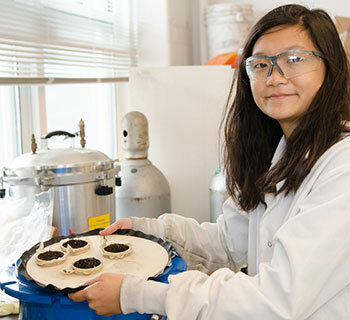 Undergraduate intern, Naomi Chang investigates the use of biochar to treat stormwater. Interested in a water-related topic not listed here? Questions? Contact Martha Narvaez, Policy Scientist, mcorrozi@udel.edu or 302-831-4931.